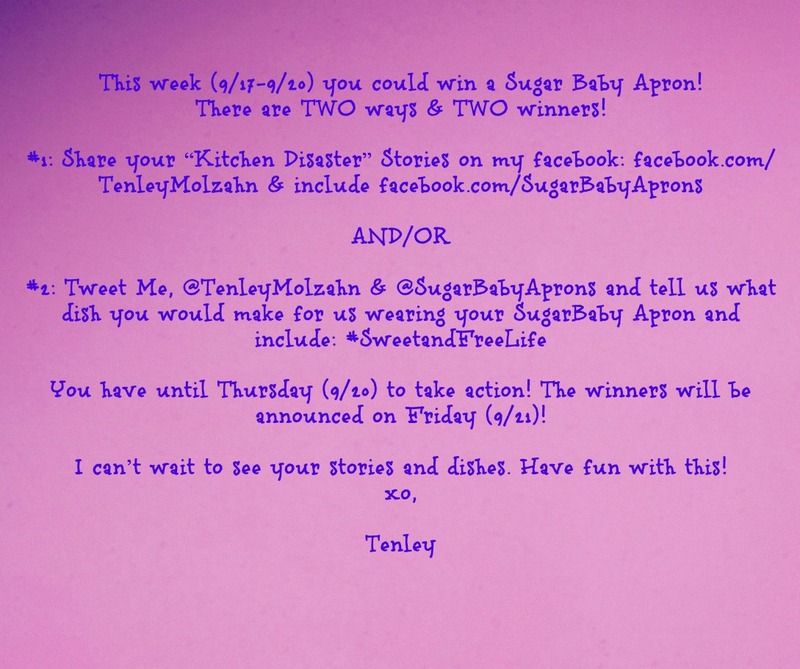 To enter the facebook contest make sure you write to me: Facebook.com/TenleyMolzahn and include Facebook.com/SugarBabyAprons - We Can't wait to hear your kitchen disaster stories! Great giveaway! I LOVE Sugar Baby Aprons! I wear a beautiful apron every time I cook and I have an older one that I use for cleaning. Jenifer! Yay! Glad you like this giveaway, I think it’s so much fun. Glad you love Sugar Baby Aprons too! Homemade foods. And sweat tea on top of it all. My dream to is to meet you some day I love you and how sweet you are and how you have always kept your head held high. I have a friend that is glunten free like you. I need the super hero part of the apron. Mom, I promise you this is the trick, a good apron. It’s the answer to why I have loved the kitchen more than ever in the last few years! TENLEY you are amazing! I love you, and I’m def going to enter! We have winners!! Sorry I announce a little late. Our winners are Danika Murray and Stacy Joyce Kennedy.